Their name: I don't know exactly why, but "Bad Bad Ball" gives me a chuckle. It kind of reminds me of someone reprimanding a dog or something--but instead of "bad dog!" it's "bad ball! You've been a bad bad ball!" A cheap, strange, yet fun name to match these cheap, strange, yet fun toys. Their packaging artwork: Sweet Jesus, do I dig the amazing '80s-drenched presentation of these bizarros. Especially the artwork on the header part of the package. It lives up fully to the crappy-awesomeness of the toys themselves, showing the balls being their bad bad, pencil-sitting selves in a garishly-cool way. The fact that the artwork shows monsters that don't even match up with the ones you get with the toys only serves to amuse further. I also love that the box functions as a really nice display piece; you can put it on a shelf and take in all eight balls through the box's clear plastic while you also admire the wacky artwork. Their pastelness: It amazes me that at some point in the Bad Bad Balls production process, one or more person made the decision to release them in super-pastel, Easter-ish colors. 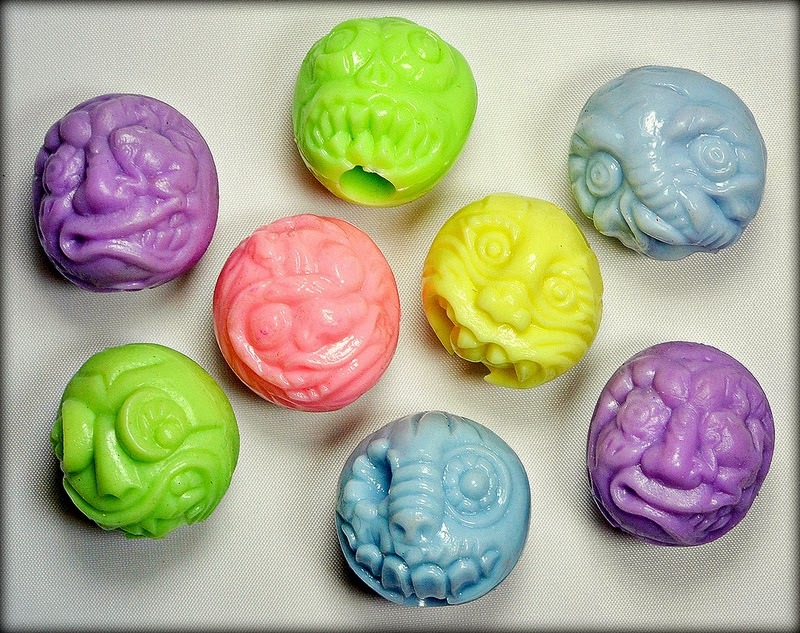 Because pastels are the natural choice for toys depicting demented, disfigured monsters, right? When it comes to cheap, weird toys, I love when they reek of decisions that make absolutely no sense. It makes them even more special. 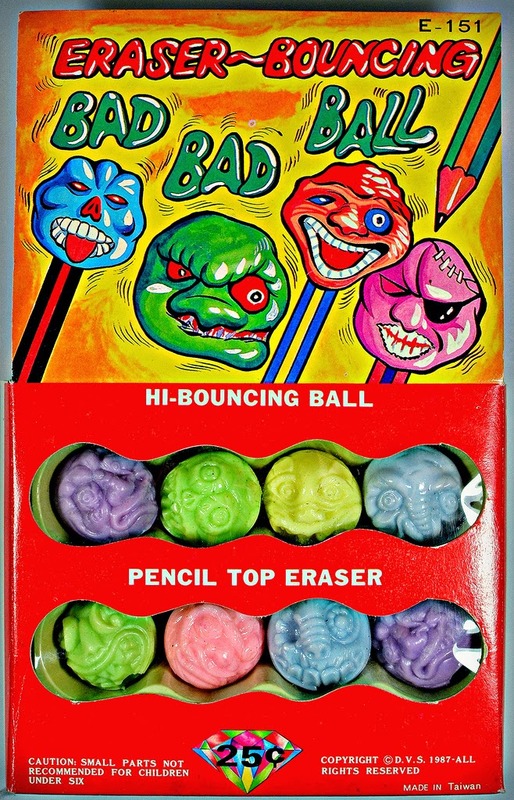 Their multi-functionality: As the box makes sure to point out, the Bad Bad Balls function as both hi-bouncing balls AND pencil top erasers. Hours of fun x 2. And finally, the sculpts themselves! 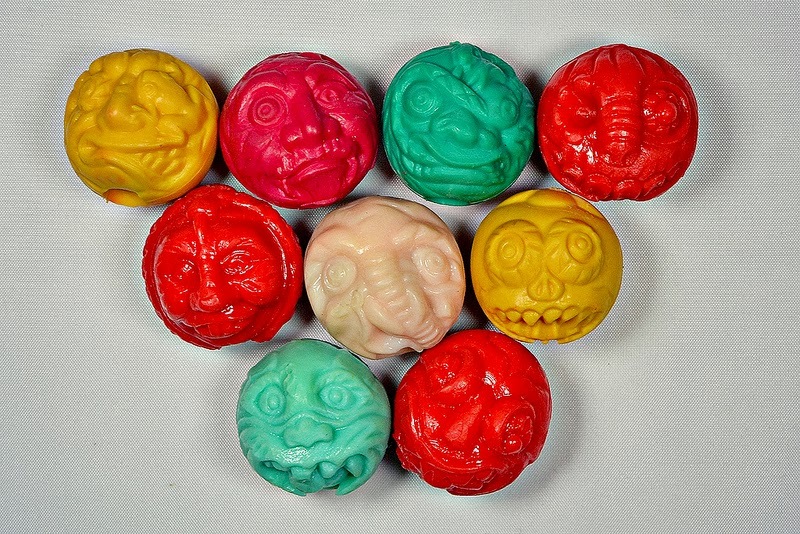 There are some real winners here, such as a dope with a frog making its home in his eye socket (my favorite! ), a creeper with a snake coming out of his mouth and wrapping around his noggin, and a shriveled guy with an elephant's trunk. As you can see, for the most part these versions came in much richer, bolder colors than the 1987 Bad Bad Balls. When I combined the different sculpts from both the '80s and '90s versions, I came up with a total of nine different sculpts that I have (pictured at the end of this post). I spotted at least one additional that I don't have in the post that Blarghhhspot did on these, so maybe there's 10 total? And there you have it, another cool curiosity from the land of obscure and bizarre toys. What do you think of the Bad Bad Balls? Do you remember seeing these anywhere back in the day? Yeah, I've got some of those as well! They're fun. 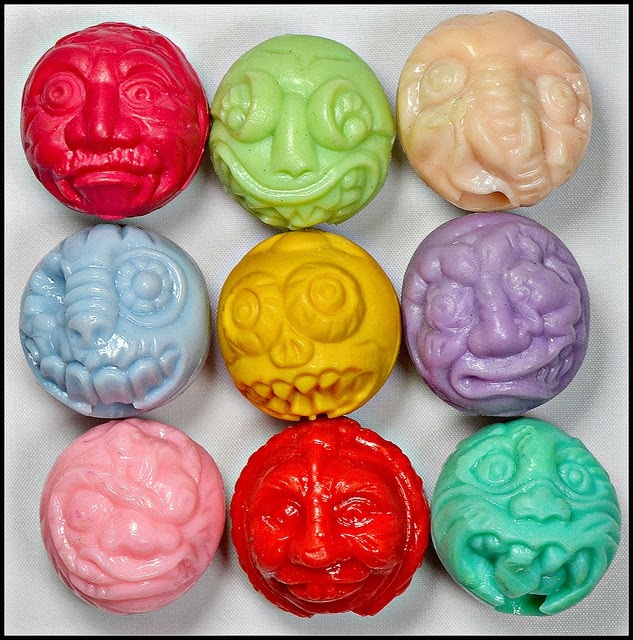 There was so much random Madballs knockoff stuff produced.